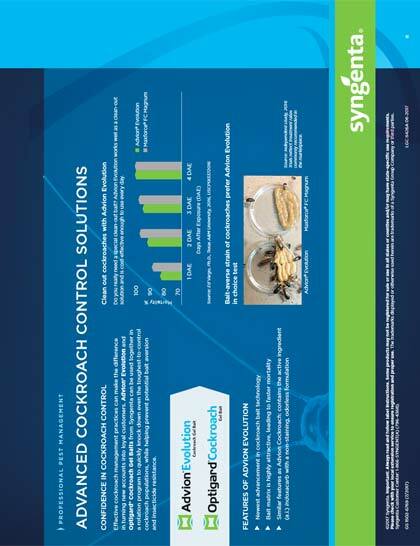 Advion® Evolution Cockroach Gel Bait features the proven performance of indoxacarb, the same trusted active ingredient (a.i.) found in Advion Cockroach Gel Bait. Its enhanced bait matrix is highly attractive to cockroaches, which results in increased feeding and faster kill for even the toughest-to-control populations. View the Labels/SDS information for Advion Evolution Cockroach Gel Bait Insecticide. 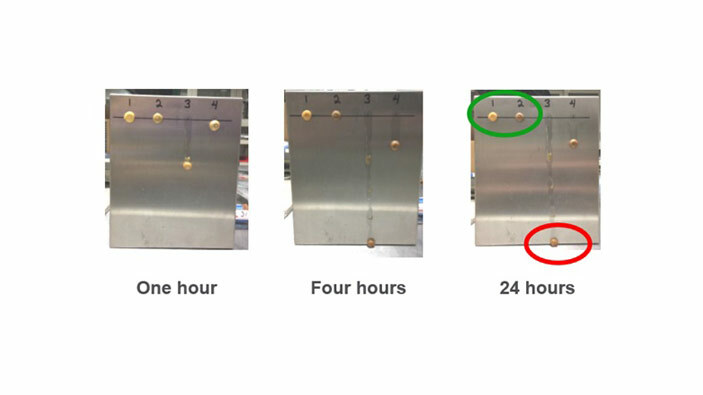 One gram each of four different cockroach gel baits was placed on a stainless steel plate to test stability at 73° F. Number 1 was Advion Cockroach, Number 2 was Advion Evolution, Number 3 was Maxforce® FC Magnum and Number 4 was Vendetta® Plus. After 4 hours and 24 hours, respectively, Advion Evolution maintained its original placement while Maxforce FC Magnum and Vendetta Plus slid down the plate. 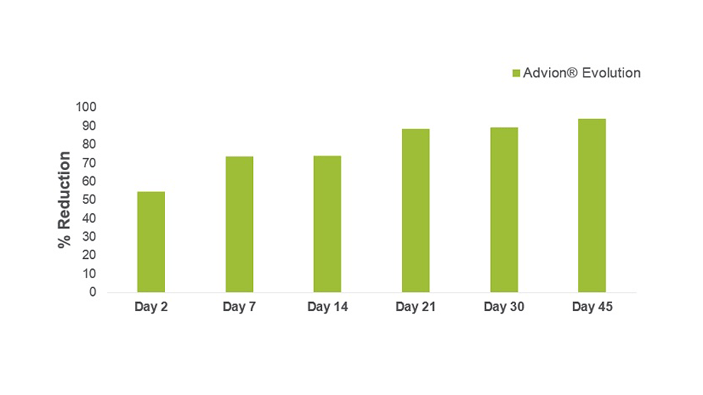 Trials reflect treatment rates and mixing partners commonly recommended in the marketplace. As part of a choice test, Advion Evolution and Maxforce FC Select were offered to a recent field-collected strain of German cockroaches, "Meriwell," that has been exposed to gel baits in the past. 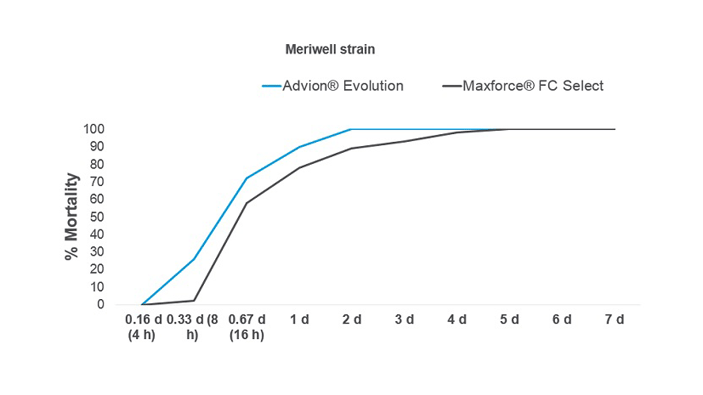 While the baits performed similarly, Advion Evolution was consumed at a greater rate than Maxforce FC Select, resulting in faster control. 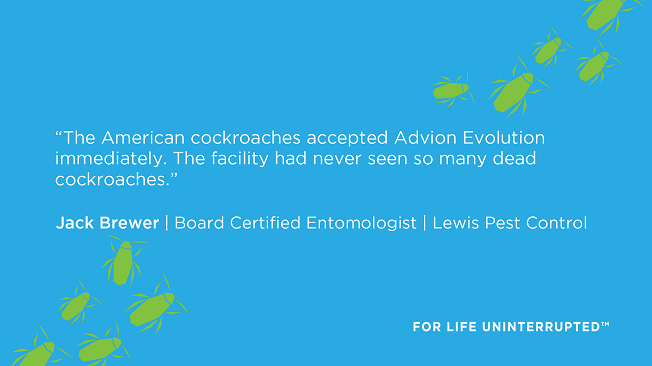 Advion Evolution was applied in an apartment complex containing large populations of German cockroaches. 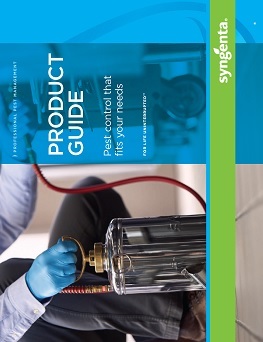 Pre-treatment monitoring resulted in approximately 150 cockroaches trapped overnight in each apartment. Even without the addition of other control methods like physical modification, Advion Evolution was found to be an effective clean-out treatment, providing more than 90 percent control using less than two 30-gram syringes of bait per apartment. "Our company had the opportunity to start up a new account, and it was challenging. It was a poultry hatchery facility, and there was a large infestation of American cockroaches. The account was challenging due to moist conditions with drains and lots of crevices. It was decided to give the new Advion Evolution Cockroach Gel Bait a try. Excellent results. The American cockroaches accepted it immediately and the facility had never seen so many dead cockroaches." Cockroaches adapt quickly, which is why it's important to rotate gel baits to help manage potential aversion and resistance. Advion Evolution or Advion Cockroach, along with Optigard® Cockroach Gel Bait, can be used as part of a recommended three-month rotation, which matches the average life cycle of a German cockroach. 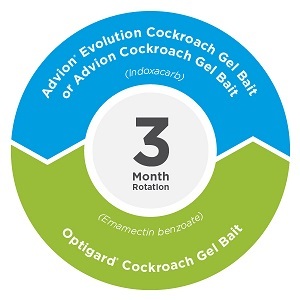 Receive yearlong rebates on purchases of Advion Evolution Cockroach Gel Bait with the PestPartners℠ 365 Program. Effective cockroach management practices can make the difference in turning new accounts into loyal customers. *The Advion Evolution Cockroach Gel Bait Bonus offer is only available for PMPs located in the state of California.